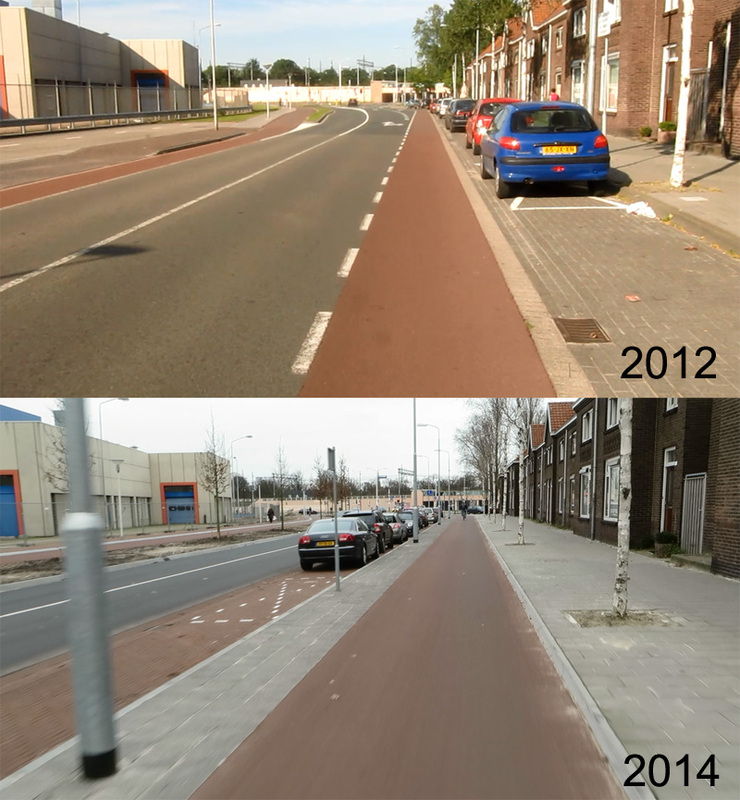 The streets in the Netherlands are constantly and rapidly being improved for cycling. 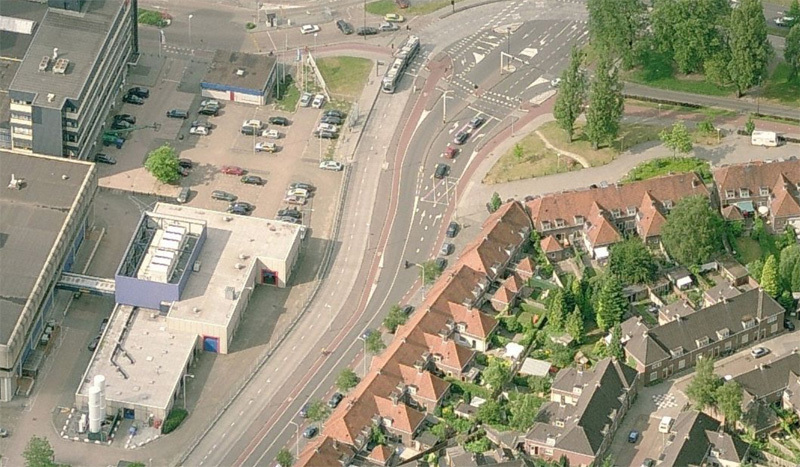 For this post I have another before and after example, this time in the city of Eindhoven. By chance I had filmed the streets Kastanjelaan en Glaslaan in 2012 as part of a route I took, cycling from Hovenring to Eindhoven’s central station (see that post here). These two streets formed the worst part of that particular route with cycle lanes in the door zone of parked cars. But when I visited the same streets again in 2014 the cycle lanes had turned into protected cycle tracks. The cycle infrastructure in both these streets is now of the same high standard as the rest of the route that already had protected cycle tracks. A search on the internet quickly revealed that the transformation of the streets had taken place in the second half of 2013. These streets formerly had a separate bus track (one bus lane in each direction), but that was no longer used. So where did the buses go? The streets go around the outside of a former industrial site called “Strijp S” that belonged to Philips. After this multinational relocated its production, the area -and all the buildings on it- was disused and it had to be redeveloped. This started in 2006 and as part of this redevelopment a new bus route now goes straight through the area, making the original bus lanes obsolete. The transformation of the former industrial site has been on course for 8 years now and is expected to continue until 2020. The site measures 31 hectares (66 acres) and will become a mainly residential area with approximately 2,500 to 3,000 homes. But there will also be 90,000 m2 of office buildings and 30,000 m2 of commercial and cultural facilities. A number of the monumental factory buildings from the 1920s survived two bombings in World War II (one by the British and one by the Nazis), but also some buildings that were built shortly after the war have a monument status. 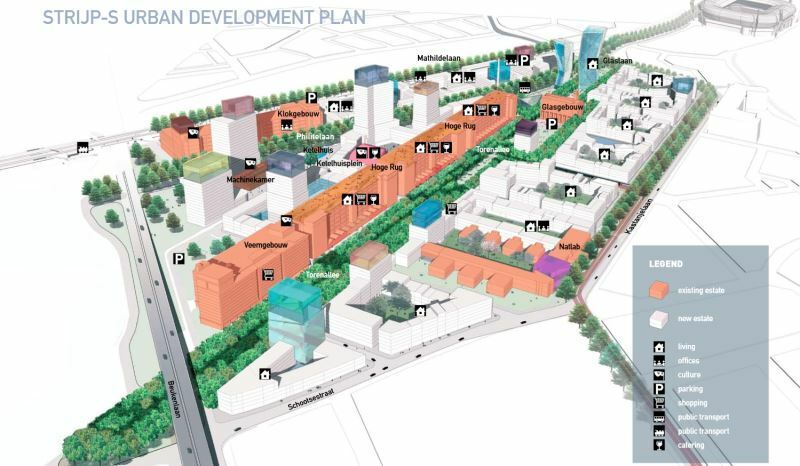 The Strijp S redevelopment plan. The pink buildings are original and all the white buildings are new. In the place of the original two bus lanes the city of Eindhoven now built separated cycle tracks, a new side-walk on one side of the street and even an extra parking lane. In the reconstruction all the original trees in both streets could be spared and there was even room for a new line of trees. 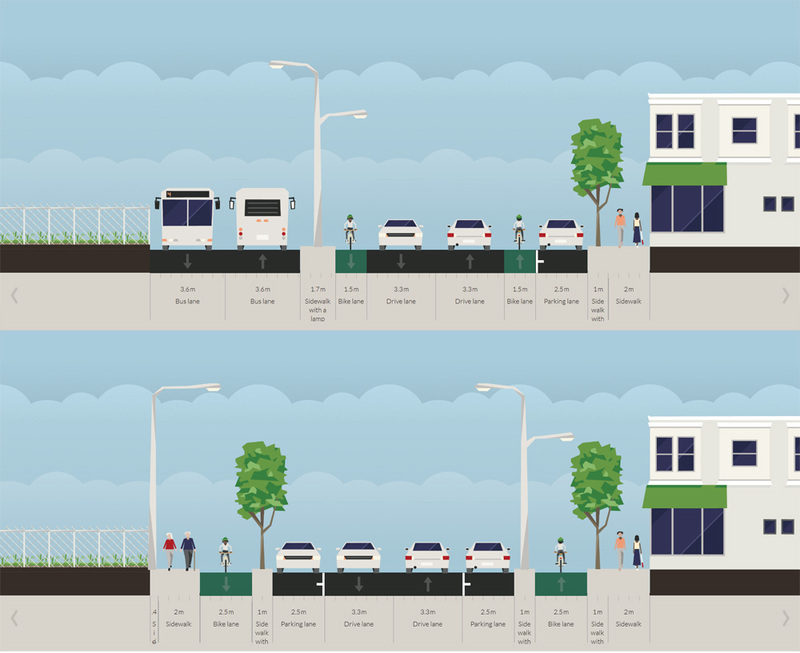 A before and after made with Streetmix. Not to scale, but this does give you an indication of how the space was originally used and how the street was rearranged. The former industrial site is on the left here. As is customary in the Netherlands, the opportunity was seized to renew the sewer pipes in the process. The local newspaper reported that the reconstruction had been postponed earlier because of budget cuts. However, with the help of subsidies of the province and the developer of the former factory area, the reconstruction could now take place after all. In total the reconstruction cost 1.5 milion euro (including 300,000 euro for the sewer works). The province contributed 435,000 euro to that amount, the developing consortium of Park Strijp S (in which the city is also a participant) paid 385,000 euro. The money from the province came from their budget for the improvement of the city’s accessibility, public transport and improving the safety of vulnerable road users. Glaslaan in 2012 and 2014. From a cycle lane in the door zone to a protected one way cycle track at both sides of the street. The trees remained in the same place. Only the street layout was changed. While the streets have now been completed, the redevelopment of the former Philips factory area has not. But all the people who will be living there in the future will be able use the safer and more attractive route for cycling to the city centre. My video, showing before and after in the same window. I was thinking for a while about letting you know this was done, since you’ve been there already, nice to see you got the same idea. I take this route almost daily and it really is much better this way. Where did the busway go? As I tried to explain in the text, a new bus route goes straight through the area that is being redeveloped, no longer around it in this street. 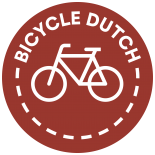 This entry was posted on 24 April 2014 by Bicycle Dutch in Original posts and tagged before and after, Eindhoven.